How fitting it would be if Bahrain's uprising were finally resolved in the same manner in which it originally was not resolved--with a political deal brokered by the crown prince--an appropriately absurd result to highlight even more starkly how far the turmoil, bloodshed, and political posturing of the previous two years accomplished *literally* nothing. The most decisive moment of the uprising was of course the two days March 12 and March 13, in which time Sh. Salman failed to coax opposition leaders to the bargaining table despite offering a generous seven-course menu of thorny political issues that he, and by implication King Hamad, was ostensibly prepared to discuss. Al-Wifaq demanded the government first agree to an elected constitutional assembly empowered to revise the 2002 charter, and got nothing. The ill-fated Coalition for a Republic demanded--well--a republic, and got thrown in jail. And, finally, senior Al Khalifa conservatives demanded that the king's son (as my friend Jeremy Cochrane's dad used to say) stop horse-assin' around, and got in touch with their friends from Saudi Arabia to help put an end to all that crazy dialogue talk. Now, nearly two years later, history may be on the brink of (hopefully not) repeating itself, with Crown Prince Salman issuing a surprise call for renewed political talks at last week's appropriately-named Manama Dialogue conference. While some criticized the event both for its percieved legitimation of the government's position as well as for the seeming lack of attention on Bahrain at a forum on regional security (I will acknowledge that I underestimated its usefulness and, later, the seriousness of Sh. Salman's announcement), it seems--and I've heard from some who would know--that Bahrain was indeed on the agenda. 1. A senior and (more or less) neutral royal is finally taking the lead. Following Sh. Salman's very public March 2011 failure, the government set out to ensure that it would not be embarrassed again. To this end, its choices of sponsor for subsequent dialogues--or what it called dialogues--were either powerless to broker any actual agreement (Khalifa Al Dhaharani, during the National Dialogue); or so uncompromising that it could be sure not to lose face (Sh. Khalid bin Ahmad, earlier this spring). The problem with Al Dhaharani, and with the entire National Dialogue, should be clear enough. The main problem with Sh. Khalid was that he was hopelessly partisan: not only does he despise the opposition (and Shi'a generally), but he is an active supporter of one segment of the Sunni counter-opposition. This leads directly to encouraging sign number two. 2. Bahrain's Sunnis will not be excluded. The most recent attempt to restart dialogue sponsored by Sh. Khalid ultimately was scuttled because it was stuck in the old paradigm of backdoor talks between the government and opposition. Entirely excluded from the negotiating table, that is, were representatives from Sunni society, and this despite Sunnis' decisive role in checking the momentum of the uprising in February and March 2011. Upset that the state would seek to negotiate without their input, the National Unity Gathering and Sahwat al-Fatih both rallied against the still-theoretical dialogue, and it was never to be heard from again. By contrast, the crown prince's new initiative will reportedly take the form of "a conference on human rights that would bring together Shia and Sunni parties and pave the way for a political dialogue." 'Ali Salman also is said (in the same Financial Times article) to have agreed to three-way talks. Certainly, many Sunnis will continue to oppose on principle any government talks with the opposition. They will (and, as will be discussed shortly, already are) decrying the weakness and stupidity of a government that negotiates with "terrorists." Yet, as demonstrated already in the case of Sh. Khalid's failed initiative this spring, a sizable proportion of Bahraini Sunnis will welcome the opportunity to articulate their own political grievances and vision, something they have not often had the occasion or liberty to do. 3. The United States is not involved. U.S. diplomats at the conference ... were surprised when [the crown prince -- ]previously seen as the royal family's leading reformer -- failed to mention the United States by name when listing allies that have provided critical support during the disturbances. He also spoke of countries that "selectively" criticize Bahrain's leadership, without citing specific examples. Aww SCHNAP! Not citing examples? I bet he didn't show his work either. Meanwhile, Deputy Secretary of State William Burns, who led the U.S. delegation, emphasized "the urgent challenges of Iran's reckless behavior." On reform, he stated, "There is no one-size-fits-all approach to such transitions or reform processes; much will depend on local circumstances and the quality of local leadership." However, he also noted that "Long-term stability, and enduring security, depend on the full participation of all citizens in political and economic life; the belief of all citizens that their peacefully expressed views are heard and respected; [and] the conviction of all citizens that they share a stake in their country's future." In the email text of the speech distributed by the State Department, the three mentions of the word "all" were each in bold type. Ya, that's right, you heard him: bold! Like others, Henderson concludes that "[t]he exchange suggests that the gap in perceptions between Washington and Manama is as wide as ever"; and that, "[g]oing forward, two dangers threaten U.S.-Bahraini relations. The first is that Iran will attempt to further weaken the relationship; the second is that Washington has made seemingly little effort to repair it." All together, now: GOOD! If there is one sure-fire way to derail any attempt at political compromise in Bahrain, it is by involving--or even hinting at the involvement of--the United States. Do we somehow need to be reminded of the "Ayatollah Obama" columns in Al-Watan? And of the National Unity Gathering rally against the quadrilateral terrorist axis of Iran, al-Wifaq, Hizballah, and the United States? And of the defense minister's explicit claim of a U.S.-Iranian conspiracy behind the uprising? In fact, I would hazard that this public "affront" is a bit of well-calculated political theater aimed at (1) ensuring Bahrainis that the U.S. is not involved in the crown prince's initiative; and (2) distancing him from the U.S. altogether--indeed, maybe even earning him a few points with (the mainly Sunni) critics of American "interference" in Bahrain. It is certainly a more clever crown prince comeback plan than sending him home from Washington with a few spare helicopter parts and humvees. And since the State Department has already tried that twice, and failed twice, perhaps a change of strategy is even to be expected here. 4. The formal opposition is on board but remains defiant. Here we have another delicate balance that must be achieved if dialogue is to succeed or even proceed: the formal opposition (i.e., al-Wifaq) must remain defiant enough to be seen as representative of and, from the state's perspective, in relative control of the protest movement, while at the same time not so provocative as to aid in the (inevitable) mobilization of security-minded citizens and royals against the intitiative. 'Ali Salman's fiery but still moderate speech last Friday--in which he lectured and corrected those chanting the familiar "down with the regime" slogan--is seen to indicate that al-Wifaq has now grasped the importance of this dialectic. 5. Hardliners are flipping out. Thus, if one assumes that this vehemence is roughly in proportion with perceptions of the likelihood that Sh. Salman will succeed at least in initiating talks, then one should be fairly optimistic. With his out-of-the-blue resurrection, the crown prince has caught Al Khalifa hardliners off guard. Of course, it goes without saying that Sh. Salman still faces an uphill battle. Whether Saudi Arabia would accept any political reform next door at a time when it faces its own domestic challenges--and a looming decision regarding succession--remains a question. So too is the U.S.'s willingness to exert real pressure against potential spoilers within both the Al Khalifa and the Al Sa'ud. I am told that, from the tone of U.S. participants at the Manama Dialogue, U.S. patience may indeed have reached a breaking point, and that unusual and potentially important meetings took place. I suppose we shall have to wait and see. Update: 'Ali Salman talks to the BBC (with audio), suggests British mediation if talks with crown prince fail. Freelance journalist Reese Erlich, whose reporting from Bahrain has recently been made an NPR segment, now has a new three-part series in The Global Post called "Bahrain: The Forgotten Uprising." More tellingly, Sunnis are no longer mere cheerleaders for the Al Khalifas. Inter-sect marriage rates are still sharply down, but the boycott Sunnis waged on Shia merchants is petering out. Sunni thugs who went on pogroms armed with swords have retreated back to Muharraq, an island suburb of Manama. And many Sunnis are increasingly voicing the same socio-economic grievances as Shias. They gripe about the lack of affordable housing, the low pensions, utility hikes and the ruling family’s penchant for grabbing land and power. “We feel the Al Khailfas are defending their own interests, not Sunnis,” says a member of the National Unity Gathering, a Sunni caucus. Ten of the 22 cabinet posts are filled by royals. The country’s prime minister, an uncle of the king, has spent 41 years on the job, longer than even Libya’s late Colonel Qaddafi. So nervous do the Al Khalifas seem of their people—Sunnis and Shias alike—that they disinvited both from a security studies conference held earlier this month in the capital. The organisers opted for pliable migrant worker drivers to ferry delegates, not local ones who might speak their minds. And while giving the podium to Syria’s Sunni opposition, they kept Bahrain’s Shia ones safely away with road-blocks defended by armoured cars. 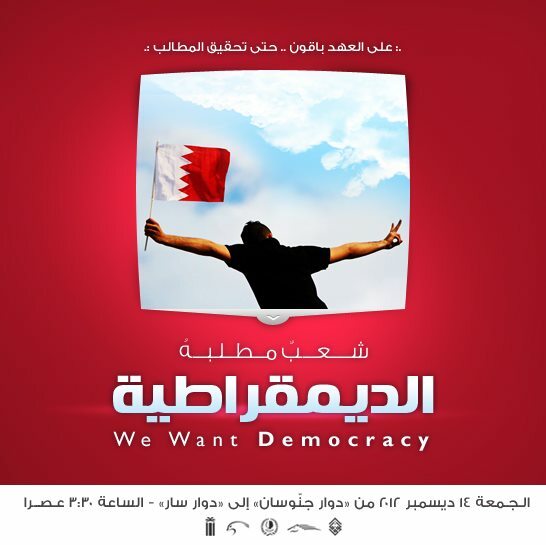 Fittingly for a conference called the Manama Dialogue, Bahrain’s supposedly reformist Crown Prince launched the event with an appeal for an internal dialogue as “the only way forward”. But given that few of his subjects were present, it seemed primarily aimed for international consumption. I think the deal (if there will be) should be no less than the demands of the first day of the uprising: a new constitution & a fully powered parliament, & deportation of the mercenaries, then slowly democratize the government. the problem is, anybody that knows Bahrain & the ruling family in particular, knows that a real parliament is the red line, & that is the biggest problem here. why? because a parliament means the end of corruption + inequality. Your best post yet. A perfect balance of humor, special effects and analysis. Thank you for making this rollercoaster ride a little more bearable. I'm Giulia. The professor Newman gave me your email for ask you some information for my thesis. My thesis will concern the freedom of thought and religion in the Arab countries with particular attention to the current situation of the Shiites in Bahrain. I wanted to ask if you you can recommend bibliography on Shiites in Bahrain in relation to the political situation. And if You had an Arabic text of any judgment or legal process, or anything concerning the topic. Maybe I should start blogging, then I will too have hot Italian girls sending me postings like this! Come on over Giulia! Bella Bella!! If you haven't read it already, I would recommend Laurence Louer's "Transnational Shi'a Politics," which examines the Shi'a of Bahrain, Saudi Arabia, and Kuwait. I have not come across any Arabic legal texts, however. Sorry.